Please read and understand the booking conditions applying to Red Funnel Holidays. All and any business undertaken by Southampton Isle of Wight and South of England Royal Mail Steam Packet Company Limited, trading as Red Funnel Holidays at 12 Bugle Street, Southampton, Hampshire SO14 2JY including where appropriate its employees, agents, independent contractors and sub-contractors who shall all have the benefit of the defences and limitations provided by these Booking Terms & Conditions (“the Company”) is transacted subject to the conditions set out below and each condition of any agreement between the Company and all those listed on email or printed confirmation. No agent or employee of the Company has the Company’s authority to alter or vary the conditions. 1.1. Bookings can be made by telephone (subject to a £5 booking fee) or online via www.redfunnel.co.uk. 1.3. Telephone Bookings may or may not be immediately confirmable and payment (full or Payment Plan*) will not be taken until accommodation is secured and confirmed. 1.4. A discount of 25% on vehicle ferry travel (originating from and returning to Southampton) is applicable to the first vehicle (or for 4 foot passengers on the vehicle ferry only) only when booked in conjunction with accommodation through Red Funnel Holidays. 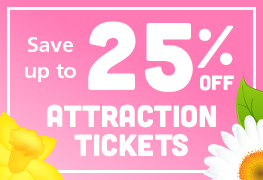 Applicable to new bookings only, and not valid in conjunction with any other promotional offer, voucher or season ticket. Not valid for freight or commercial vehicles. 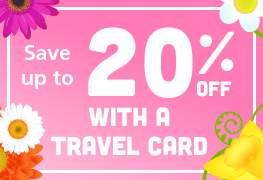 Excludes any other packages already including the ferry crossing. Red Funnel reserves the right to cancel or amend this offer at any time. 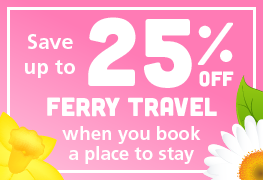 If Red Funnel is unable to fulfil an accommodation booking for whatever reason, the 25% discount for ferry travel is no longer applicable and standard ferry travel rates will apply. 1.5.1. If booking is confirmed more than 60 days prior to travel customers may opt to pay in full or select a Payment Plan* option (when booking ferry travel at the same time, if no ferry travel is included full balance is required). 1.5.2. If booking is confirmed and agreed less than 60 days prior to travel, full balance of the accommodation element of the booking is required. 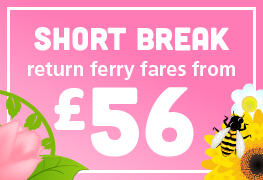 Ferry travel can be secured with a £25 deposit with full payment via a Payment Plan* due no less than 30 days prior to travel. 1.5.3. If booking is confirmed and agreed 30 days or less prior to travel, full balance, of all elements of the booking, is required. 1.5.4. If payment is not received as per above the Company reserves the right to treat the booking as cancelled and levy charges as detailed in Condition 7.2. 1.5.5. By making a payment (full or Payment Plan*) customers are agreeing to and are bound by the Booking Terms & Conditions as set out in this agreement. * If choosing the Payment Plan option, it is your responsibility to notify Red Funnel should your registered payment card change or expire. Please register the new card online via www.redfunnel.co.uk and call 02380 019192 to notify us that the payment will be from an alternative card. If any payment(s) within the plan are unsuccessful, the booking will be cancelled which will invalidate all related documents previously sent. If booking via telephone, cards must be registered online to apply a Payment Plan or full payment will be required at time of confirmation. 2.1. Whilst Red Funnel will endeavour to provide our customers with the best prices available, Red Funnel is not a price comparison site and advertises only prices provided to us by the accommodation providers. As such Red Funnel take no responsibility, nor offer any compensation for offers or alternative pricing that may be available elsewhere. 2.2. Prices are based on projection of known costs at the time they are published (whether in print or digital format) and VAT at the applicable rate. The Company may, in certain circumstances absorb some of the increase in any changes in VAT but reserves the right to amend the VAT element of prices in the event of a change in the rate of VAT. The Company also reserves the right to amend prices where such amendments arise from Governmental action. In such cases, the Company reserves the right to vary prices accordingly, and re-invoice at the new rate. 3.1. For the avoidance of doubt, no contract exists (between you the Customer, and the Company) until the Company issues a confirmation and receives the deposit or full payment, as per terms stated. 3.2. Once received it is the responsibility of you as the customer to check all confirmation details, and advise accordingly if incorrect. 3.3. It is the responsibility of you as the customer to check and adhere to any Key/Essential information detailed on the applicable Red Funnel Accommodation page and/or email confirmation and any of its attachments or links. 3.4. Red Funnel will not accept any responsibility for any incorrect or undisclosed details that result in the cancellation or amendment of the booking by the Accommodation Provider. 4.1. By providing us with your details, you are enabling us to process your booking accordingly. In respect of your booking arrangements it may be necessary for us to pass certain contact details (landline, mobile telephone, and/or email address) to your accommodation provider, in case of (but not limited to) emergencies, alterations to or clarity of booking. By accepting confirmation and making payment (full or Payment Plan*) you agree to Red Funnel storing, using and passing on the contact details (to the Accommodation Provider only) for the reasons stated. 5.1. The Company recommend that all travellers obtain adequate travel insurance at time of purchase but at least prior to departure. The Company will not be held responsible in any way (monetary or otherwise) for failure to do so, including but not limited to cancellations or amendments prior to travel or issues arising whilst travelling or during your stay. 6.1. If you wish to make changes to your booking after written confirmation has been sent to you, the Company will endeavour to comply with such requests, but is not bound to do so. To cover administration costs, the Company will charge a fee of £25 plus, if applicable, any additional amount reflecting the required changes. Unless the alteration only includes an amendment to ferry times, in which case a fee of £5.00 per leg will apply along with any applicable additional amount arising from the time changes. 6.2. If the number of persons in a booking change, the holiday price will be recalculated on the basis of the new party size. Any increase in price per person as a result of a part-cancellation, e.g. an under-occupancy charge for a room, will be indicated along with a cancellation charge on a revised invoice. The cancellation charge will be calculated in accordance with Condition 7.2. 6.3. The Company will use commercially reasonable endeavours to accommodate any other reasonable changes you may propose to your booking. However, if the Company is unable to make any change requested and you do not wish to continue with the booking as made, then the booking will be treated as cancelled on the date of your request for the change. Please note, unless the Company in its absolute discretion otherwise agree, a change of departure date or transfer to another hotel or self-catering site or activity requested by you will be treated as a cancellation (see Condition 7.2) and not as a change to your booking. 6.4. Any additional person added to the booking will be deemed to have knowledge of and to have accepted these Booking Terms & Conditions. 7.1. For any booking confirmed by the Company and later cancelled by you for any reason, cancellation charges as detailed in Condition 7.2 below will be payable. For the avoidance of doubt, failure to arrive for booked sailings, accommodation or vents on the scheduled day, and if applicable at the scheduled time, will be treated as a cancellation by you. Cancellation Charge Expressed as a Percentage of a Total Holiday Cost. 8.1. The Company will endeavour to ensure all information advertised, whether online or printed, is correct and up to date. The Company will also endeavour to provide the booked holiday once it has been confirmed. However, due (but not limited) to repair, renovation, adverse weather conditions or changes in Government Legislation, there may be times when Accommodation Providers may need to amend or withdraw services, facilities or their timings. Such events regrettably, are beyond the Company’s control, however, when advised of any significant changes, the Company will use commercially reasonable endeavours to contact you prior to the date of departure. 8.2. The Company also reserves the right to amend the holiday at any time whether by reason of any matter stipulated in Condition 9 or otherwise. 8.3.4. cancelling the activity/other element of the holiday, in accordance with that elements’ own individual Terms & Conditions or Cancellations Policy. 8.4. If you choose option 8.3.1 or 8.3.2, the Company will recalculate the cost of your holiday and will refund any excess monies you have already paid if the new holiday is of a lower value to the one originally booked. If the new holiday is of a higher value then you will be required to pay the excess. 8.5. If you choose option 8.3.3 or if you refuse to pay the excess, if applicable, in relation to options 8.3.1 and 8.3.2, the Company will refund all monies you have paid and no further compensation will be payable. 8.6. Please note the Company’s liability for any amendments or cancellation of your holiday will be limited to providing you with alternative arrangements/holiday or a full refund of your holiday. Other than such refunds detailed, no other compensation whatsoever will be payable by the Company in respect to any loss or damage suffered by you as a result of any failure by the Company to provide the holiday originally booked. 9.1. No responsibility will be taken by the Company for any implications caused by circumstances beyond the reasonable control of the Company, and will be deemed as Force Majeure. These circumstances may include, but are not limited to, acts of God, war or threat of war, riot, civil strife, terrorist activity, industrial dispute, natural and nuclear disaster, fire or explosions, governmental actions adverse conditions, technical problems affecting transport, closure or congestion of a sea port. 9.2. In any such circumstances deemed as Force Majeure, the Company will use reasonable commercial endeavour to notify you as soon as possible, as well as to limit or mitigate any implications to any element of your booked holiday, but can take no responsibility for any losses incurred in such circumstances. 10.1. Ferry sailing schedules are for guidance only and are subject to change as a result of changes in the Company’s operating procedure. In the event that passengers have booked specific sailing times the Company will use commercially reasonable endeavours, subject to Condition 9, to carry passengers or cars on the sailing for which the booking was made or on the next available sailing, subject to Red Funnel Conditions of Carriage. The Company will display any changes to the sailing schedule at the Ferry terminal and/or on their website. 11.2. Accommodation and/or Service Providers must be given the right to rectify any issues or complaints and as such all issues must first and immediately be raised with the Accommodation and/or Service Provider at the earliest opportunity. Thus allowing the Accommodation and/or Service Provider opportunity and time to make every effort, deemed commercially reasonable, for a satisfactory resolution. 11.3. In addition to Condition 11.2 Red Funnel Holidays must be contacted as soon as possible in order to fully log any issues – failure to do so will hinder the Company’s abilities to investigate or make judgement on any such complaints. 11.4. Any issue or complaint you fail to make apparent to the Accommodation and/or Service Provider and Red Funnel Holidays at the original point of complaint may not be investigated if raised at a later date. 11.5. Red Funnel Holidays may contact the Accommodation and/or Service Provider in order to expedite a satisfactory resolution. However, if the Accommodation Provider fails to address the issue(s) and if you choose not to continue your stay the company will endeavour, but cannot guarantee, to help provide alternative accommodation (of the same or similar standard if possible). 11.6. With any alternative accommodation you will initially be liable for payment in full. No refunds will be considered at initial point of complaint but will be subject to investigation as detailed in Condition 11.10. In any event Red Funnel will endeavour to be flexible with Ferry Bookings, subject to availability. 11.8. Regardless of decision made, both the Accommodation and/or Service Provider and Red Funnel Holidays must be informed. 11.9.3.6. Including/Attaching any relevant documentation or photographic evidence that will aid the investigation or support your claim(s). 11.10. Refunds or compensation will only be considered after full investigation, and only after the full complaints procedure has been adhered to as detailed in these Booking Term and Conditions. 11.11. All complaints received in adherence with the Booking Terms and Conditions will be fully investigated, including obtaining a full report from the Accommodation and/or Service Provider and the Company will endeavour to respond to you the Customer within 21 days. passed directly to the Accommodation and/or Service Provider and their response passed directly to you where possible. 12.1.3.2. in the case of damage which is not apparent or of loss, within15 days from the date of disembarkation or re-delivery or from the time which such re-delivery should have taken place. 12.2.1. when motor vehicles are shipped, drivers must ensure that the petrol tank is not so full as to create a possibility of spillage and that the ignition is switched off. the case of small expendable cartridges hermetically sealed and packed in an outer container, when up to twelve may be carried. 12.2.2.2. all cylinders should be adequately secured against movement of the ship. 12.2.2.3. the supply should be shut off at the cylinders during the entire voyage. 12.2.2.4. leaking and inadequately secured or connected cylinders will be refused for shipment. 13.1. English Law shall apply to any dispute under these conditions and the parties submit to the non-exclusive jurisdiction of the English Courts save that in the first instance any dispute under these conditions shall, if not resolved between the parties in the first instance, be referred by the parties to The Association of Bonded Travel Organisers Trust whose decision on any matter in dispute shall be final and binding on the parties. The Company has done its best to ensure that all information published (printed or digital formats) is correct at the time of publication to any such media. All accommodation is subject to availability.